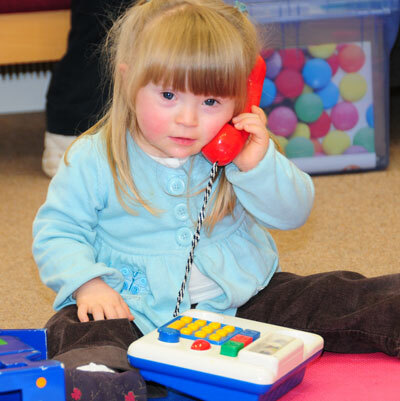 Learning to talk is a particular challenge for children with Down syndrome - more so than many other areas of development. Difficulties communicating present obstacles in daily life and can be a major source of frustration. Educational research is exploring these difficulties and ways to help. A number of early studies documented the language delays experienced by children with Down syndrome.[1,2]. When learning to talk children have to learn the meanings of lots of words (vocabulary) and then learn the rules of their language (grammar). New words are learned more slowly but steadily and continue to be learned into adult life. For many children, first words appear later than would be expected for their nonverbal mental age - in other words, their language delay cannot be fully explained by their cognitive or intellectual delay. Mastering grammar is more of a challenge and most children have Vocabulary Ages that are substantially more advanced than their Grammar Ages. Many teenagers and adults with Down syndrome make themselves understood quite well but only combine key words together (for example, nouns, verbs, adverbs) rather than using all aspects of grammar (for example, tense markers). There is evidence that grammar development is linked to vocabulary size as it is for typically-developing children. Children with Down syndrome do not begin to use grammatical markers until they can say 200-250 words - just like other children. The studies which showed that language was delayed relative to cognitive development led to a recognition that speech and language therapy should be offered to all young children with Down syndrome from the first year of life. The evidence that language improves through teenage years supports continuing therapy to adult life. 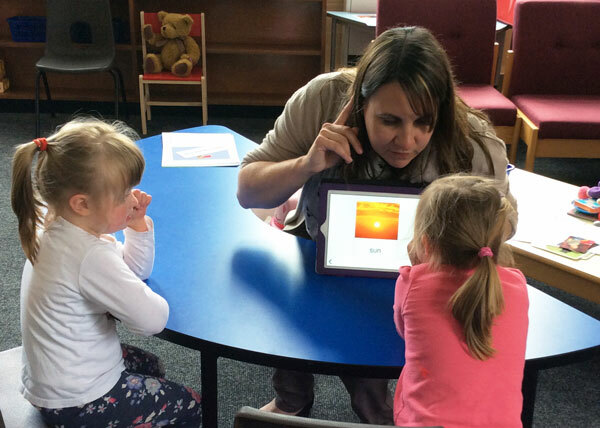 Evidence that visual supports can improve language learning has led to the widespread use of signs, pictures and print being used to teach language. Abbeduto, L., Warren, S.F. & Conners, F.A. (2007) Language development in Down syndrome: from the prelinguistic period to the acquisition of literacy. Mental Retardation and Developmental Disabilities Research Reviews 13: 247 - 261. Zampini, L. & D'odorico, L. (2013) Vocabulary development in children with Down syndrome:Longitudinal and cross-sectional data. Journal of Intellectual & Developmental Disability, 38, 310-317. Buckley, S., Pennanen, T. and Archer, T (2002). Vocabulary size and the development of grammar in the expressive language of children with Down syndrome. Presented at the Inaugural Conference of International Association of Intellectual Disabilities - Europe, University College Dublin, Ireland, June. Laws, G. & Hall, A. (2014) Early hearing loss and language abilities in children with Down syndrome. International Journal Language Communication Disorders, 49, 333-342. Fey R. S.Chapman, H. Sindberg, C. Bridge, K. Gigstead & L. Hesketh (2006 ) Effect of Memory Support and Elicited Production on Fast Mapping of New Words by Adolescents. Journal of Speech, Language, and Hearing Research, 49, 3-15. Mosse E.K. & Jarrold, C. (2011) Evidence for Preserved Novel Word Learning in Down Syndrome Suggests Multiple Routes to Vocabulary Acquisition. Journal of Speech, Language, and Hearing Research, 54, 1137-1152. Yoder, P., Woynaroski, T., Fey, M. & Warren, S. (2014) Effects of Dose Frequency of Early Communication Intervention in Young Children With and Without Down Syndrome. American Journal on Intellectual and Developmental Disabilities. 119, 17-32.